3 Pack: Hanes Men's 100% Cotton ComfortSoft Tagless T-Shirts Only $9.99 Plus FREE Shipping! You are here: Home / Great Deals / 3 Pack: Hanes Men’s 100% Cotton ComfortSoft Tagless T-Shirts Only $9.99 Plus FREE Shipping! 3 Pack: Hanes Men’s 100% Cotton ComfortSoft Tagless T-Shirts Only $9.99 Plus FREE Shipping! You can never have too many T-Shirts! 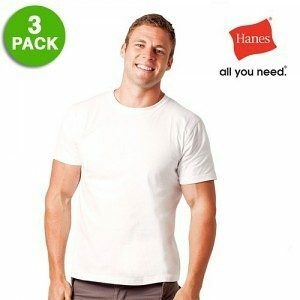 The 3 Pack: Hanes Men’s 100% Cotton ComfortSoft Tagless T-Shirts for Only $9.99 Plus FREE Shipping are an essential! Stock up now!